The Cuban Tree Frog, Osteopilus septentrionalis; up close it looks quite cute, but not if you are a gecko ..
We’ve received several calls over the last couple of months informing us of some sort of ‘monster frog’ that invaded people’s gardens and porches. Some of the informants were even stunned and frightened by what they encountered. We knew what to tell them, because the species is on the Island since 2006 and a sample is already in our freezer for quite some time already. 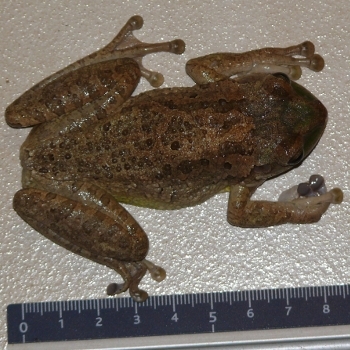 By means of some untraceable, but clearly unsanitized shipment of merchandise, the Cuban Tree frog (Osteopilus septentrionalis) was able to expand it’s area of distribution, and Curacao is now also invaded. These animals can even survive journeys by ship, while locked away in a container. When they finally get out, they’ll start feeding on insects, but also geckos and even bird hatchlings. And that’s what makes them invasive. They are nocturnal and they can climb pretty well by means of their sticky toes, so they are able to apply stealthy moves to capture food. The local fauna has no defense against such a predator (yet), so this frog might pose a real threat. The only environmental characteristic of our Island that plays against it is the semi-arid climate zone we’re in. Frogs need lots of moisture, so hopefully the relatively dry character of our Island will limit it’s procreation. Although … dry? The last couple of years were relatively wet. And that’s probably why we are receiving those calls, all of a sudden. The beast is doing well at this moment. At first, the calls came from the De Savaan and Julianadorp region, a clear indication that the original source of contamination was in that neighborhood. But later calls are coming from other neighborhoods as well, unfortunately. Let’s hope it stays out of the ‘mondi’, and will continue to harass only humans (but don’t worry too much about that, it is harmless to humans). If not, measures might be in order. Stretched out it reaches a length of about 20 cm. Two of these slimy monsters in my garden right now …van engelen area of curacao …a first for us! 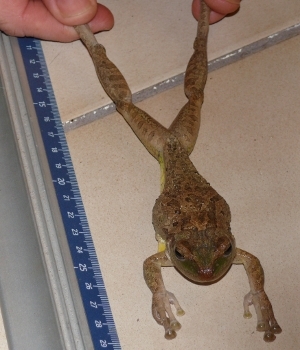 Aren’t you concerned that the frog will spread into natural areas? Are there any plans to control or eliminate them? The sooner controls are started, the easier it will be. I am very concerned. A somewhat controlling natural factor might be our semi-arid climate, but as there is no government policy on exotics / invasives, hence no coordinated action whatsoever, we should be concerned. 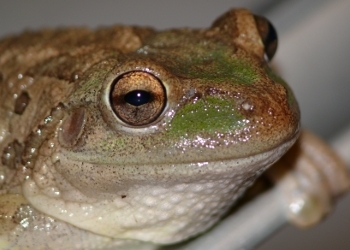 Incidentally, this concern is not only about this frog, but lots of known harmful invasives have entered the Island recently: the red palm weevil, the varroa mite, and boa constrictors, just to name a few crawling ones, not to mention several plants, like the – no surprise here – neem tree. I just had an introductory meeting with a plague of the so called “Stink bug” in my ceder trees. I could not image that this insect could multiply which such a horrible speed. What a massive mating and egg-laying activities! Incredible how they layers of eggs are hiding beneath the bark, but also plain on glass windows. I understand that this S-bug was also imported and has no enemies in our climate. Has this insect been around already for some time? Is there a “best practice” to exterminate this bug in our island?